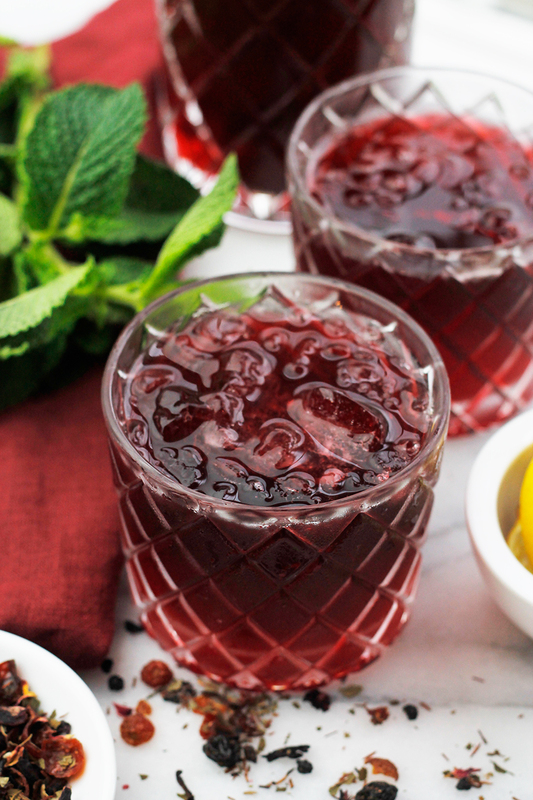 Sweet, bright, and refreshing, this Sweet Vermouth Hibiscus Tea Cocktail is great for summer entertaining. I’m not a big drinker, I occasionally have a glass of wine with dinner or with appetizers when I’m entertaining. After experiencing a sweet vermouth cocktail at a friends house, I was curious and decided to learn a bit more about the intriguing ingredient in the drinks my friend served. It was a pretty simple cocktail, she mixed sweet vermouth, sparkling water, a splash of fresh orange juice with a twist of orange zest. However, the most popular drink that uses vermouth is a martini, which is a bit too strong for my taste. Vermouth is an aromatized, fortified wine flavored with herbs, spices, seeds, flowers, barks, roots and various botanicals. It’s fortified with distilled alcohol which keeps it from spoiling as quickly as traditional wine. There are several kinds of vermouth, the most popular are red which is sweet, and white which is dry. 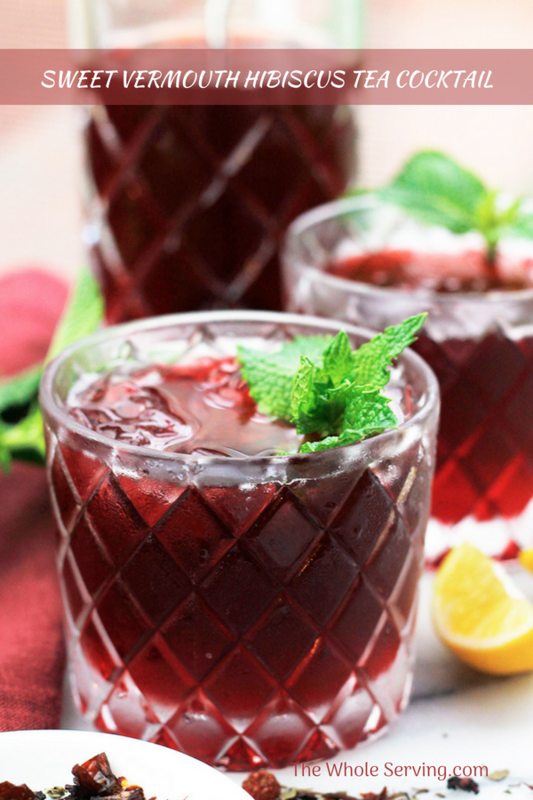 In this recipe, I used sweet vermouth and one of my favorites, hibiscus tea. You’ll need to make your tea and allow it to cool in your fridge. 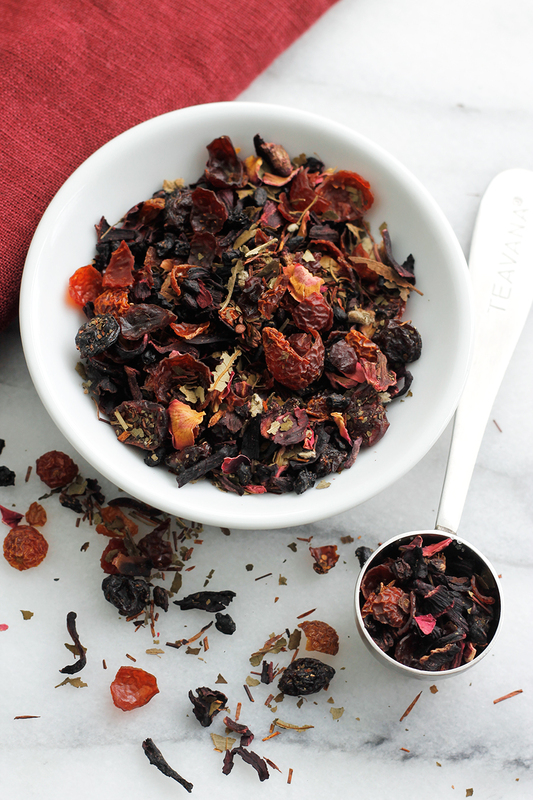 I recommend you make your tea several hours before you need it for your cocktails or overnight, so that it’s nice and chilled when you’re ready to make your cocktails. Cocktail time is super easy, simply mix, stir and pour. Kate I hope you like it, have fun! This looks absolutely amazing! I just tried a fennel infused vermouth spritzer with gin and rhubarb that was delicious. Love these summery recipes! Wow, the infused vermouth spritzer drink sounds very interesting. 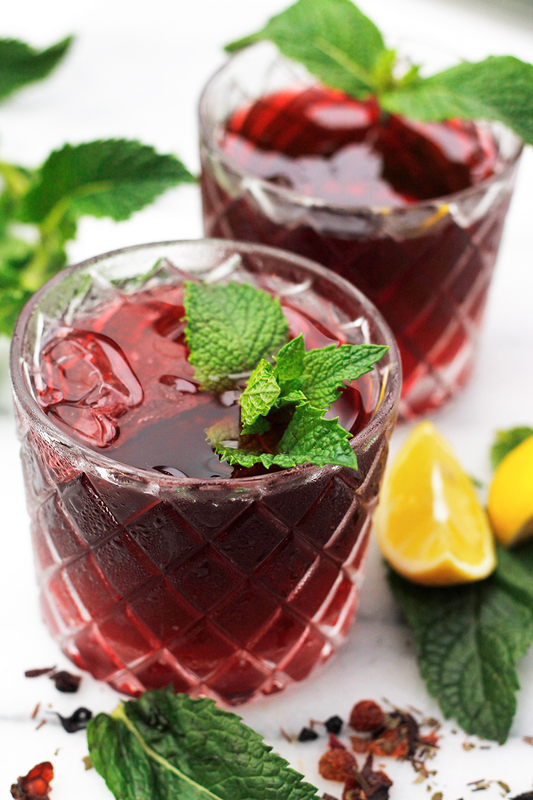 Oh my, this looks dangerously good and refreshing for a summer cocktail! Thanks Leigh, I’m not a big drinker, so drinks like this one are perfect for me. I hope you have a chance to give it a try. This cocktail looks so pretty and I bet it tastes amazing with all the different flavours marrying together! You’re right Camilla this is an amazing cocktail. The flavors are wonderful and work well together. I love iced tea and enjoy it year round. I haven’t had a cocktail like this one, it sounds like it has an interesting flavor. It’s a refreshing drink, and the flavors marry well together. 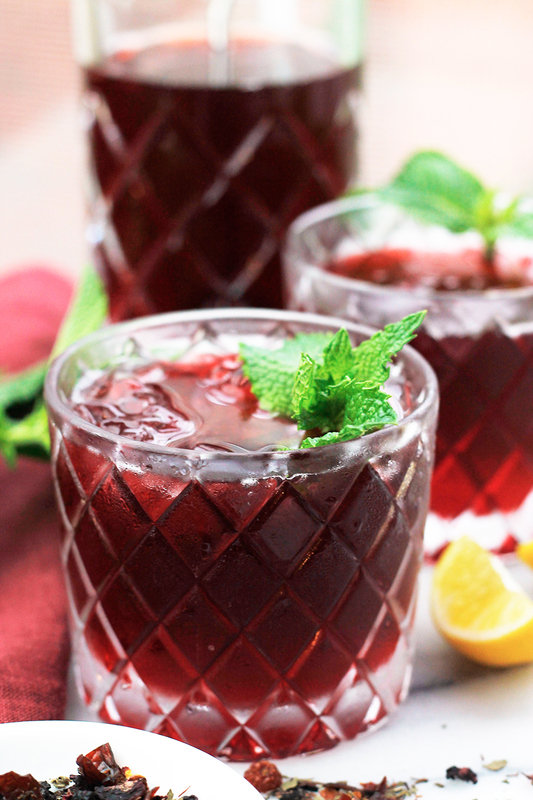 Hibiscus tea is one of my favorites and it’s wonderful in this cocktail. this sounds so refreshing but its perfect on these hot hot summer days. Looks like a winner to me! It was certainly a winner at my last gathering and I’ll be serving it at my next gathering. This sound like the perfect drink for a BBQ party. Love the colour, and the flavour combination sounds delicious too. I would make it by the pitcher full and let the guests help themselves. Gloria you and I think alike. I made a big pitcher full and my guest served themselves at my last gathering. Veena this is a good one to serve at a BBQ. I served it at our last gathering and it was a hit. I saw this and immediately wanted one. Adding the ingredients to the grocery list, stat!! IT looks fantastic for summer! You’re like me when you see something you like, you make plans to give it a try. I hope you like it, enjoy! This looks delicious! Just one question, where can you get the dried hibiscus flowers? Thanks Cathleen, I got my flowers from Whole Foods bulk tea selection. What an interesting beverage. I simply love the color and the use of limoncello is fascinating. We do use vermouth but the dry variety in cooking. I’ll have to make a point of getting the sweet variety and make this beautiful drink. 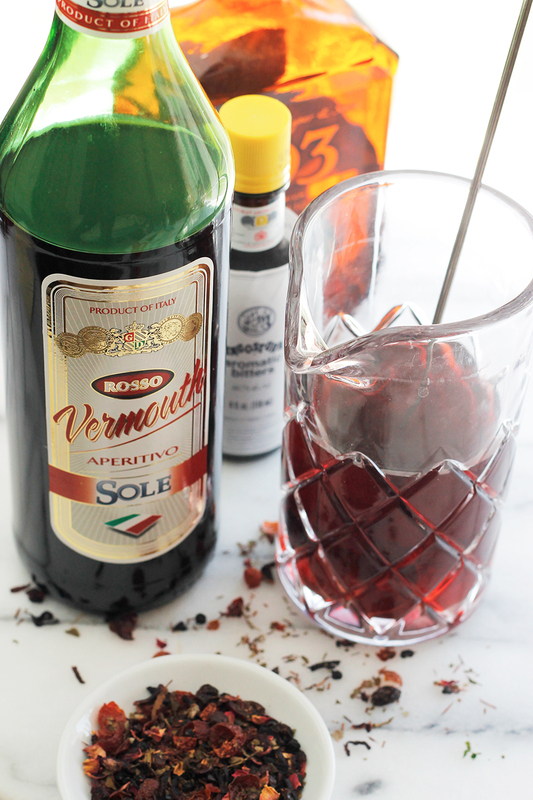 I’ve used dry vermouth in cooking as well, but after learning more about sweet vermouth I decided it was time to create a drink perfect for the hot summer months. Wow, I’m loving all the herbs and spices in this drink. Sounds like it could cure anything! Yeah, it’s amazing the number of herbs and spices in this drink. 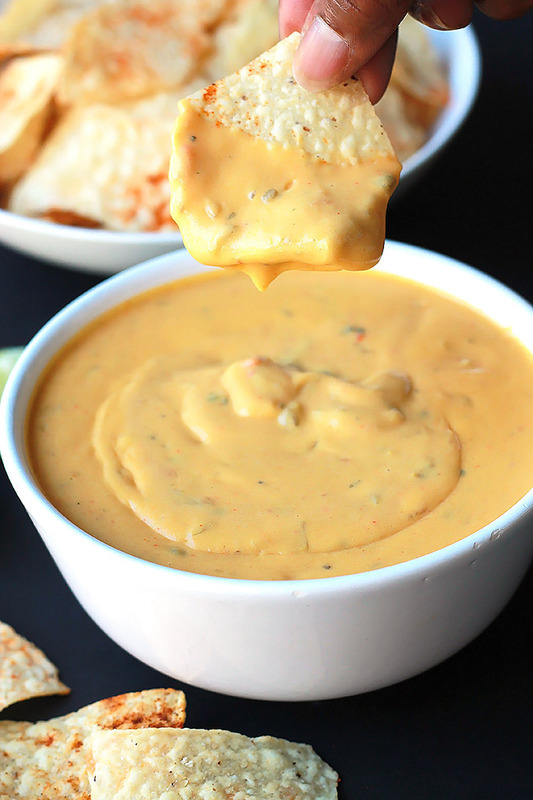 Refreshing and delicious, perfect for warm summer days. Now that’s what I call a cocktail! Beautiful and tempting! I appreciate the education, too, on what makes vermouth different from wine. I had no idea. After learning so much about how vermouth is made I was motivated to come up with a refreshing summer drink. That is one hell of a drink! How gorgeous and refreshing 😀 I am in love with the idea of combing vermouth, hibiscus and limoncello. My goodness, I need a glass of this right now ;D Cheers! Thanks Tammy, the flavors are amazing together. 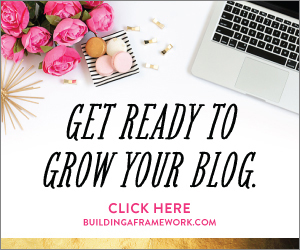 Hopefully you’ll give one this a try soon. I love the sounds of this, a nice and simple cocktail for the warm months! It also helps that it is stunning to look at! You’re right Melissa, this cocktail is simple and perfect for those hot summer days and nights. Everything about this creams, make me and drink me all summer long!!!! The colour is just beautiful and I love the use of hibiscus! Thanks, I sometimes make a batch and keep in the fridge so it’s ready when i am. Your post made me think I need to buy Vermouth now. 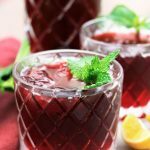 Love this hibiscus tea cocktail, I am going to make this for next weekend. Swathi I certainly hope you enjoy this drink. You can customize to suit your taste. Thanks Heather, It’s a really refreshing drink. I love vermouth. I love its flavor. This drink looks super refreshing and so enjoyable. I’m making this for me and my hubby soon. Thanks for sharing. This sounds delicious AND refreshing. 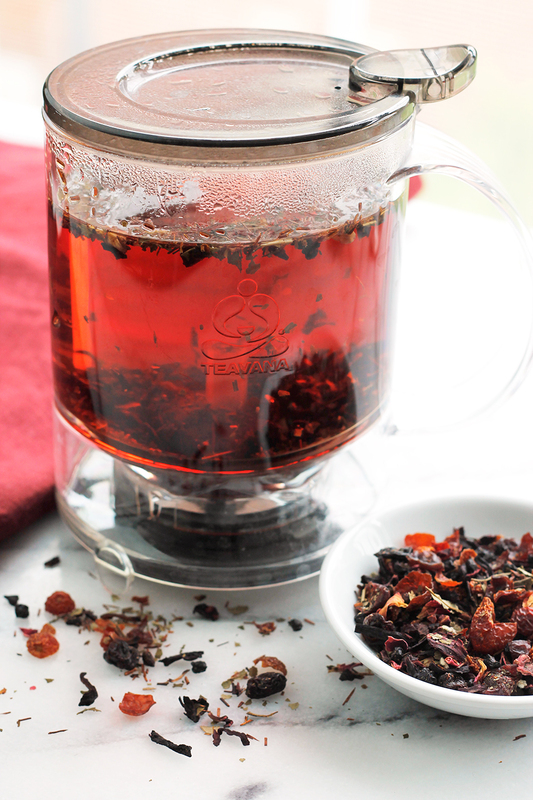 I live ina very hot climate and LOVE LOVE LOVE hibiscus tea! Def. need to try this one! Ranelle I hope you can enjoy this as much as I do. So refreshing. Love this! Going to have to try!